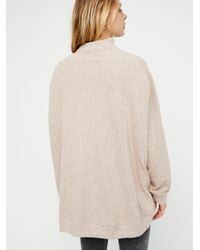 We check over 450 stores daily and we last saw this product for $65 at Free People. Ultra soft pullover in a long and oversized silhouette featuring a mock neck and hidden side pocket details. One of nine exclusive, in-house labels. Machine wash cold. Import. 76% Polyester, 24% Cotton.